"Isaiah Oliver, a 24-year-old white social worker, grew up in this overwhelmingly white city and attended the predominantly white University of Richmond in Virginia. Ask him why he supports Barack Obama and he says it's because of the candidate's race." 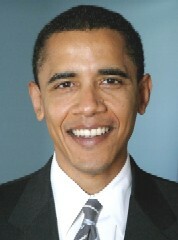 Is is me or is it starting to sound like white people want Barack for president more than black people. Whatever happens, I hope he wins! It's not a race thing. He's a good candidate. How can they describe it planly as a race thing. Look at everyone else. I support him because he stands for change. I am sick about the illegal things that has been going on in Washington. The fact that the present president got away with starting a war and putting our young people in the line of fire is unforgivable. Others, very powerful people, went along with this. I discovered that at one time, over 100 American companies are in Iraq making eleven figures in profits supporting the war efforts. That could be why powerful people went along with this war-effort. There were also foreign companies there. They are the ones who supported the decision to fight. Therefore, a great deal of Americans will be so much richer as a result of this war. On the other hand,the poor will lose their love ones. Isn't that a good reason to want a change? Things look good. He won the Iowa caucus yesterday. Wonder how New Hampshire will look.